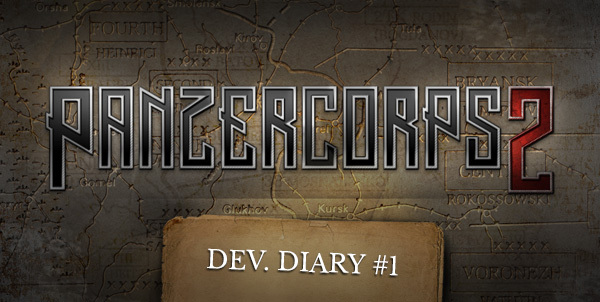 Welcome to the first issue of Panzer Corps 2 Developer Diaries. The initial announcement of Panzer Corps 2 was a little while ago now, and we understand that it left many people waiting for more information. In this issue we will try to provide a general overview of where we are going with this project and what to expect from it. We will provide much more information on each individual aspect of the game in future diaries. Overrun. This was probably the most requested feature in Panzer Corps, and we had no other option other than to include it. Overrun is a unique ability of tanks to run over crippled enemy units and destroy them in the process, without spending their move or attack action. This feature not only helps to better represent the role of tanks in WW2, but also gives many interesting tactical implications from a pure gameplay point of view. Encirclements. Panzer Corps is a “wargame” in the first place, and for most players its “war” aspect is the most interesting of all. On the other hand, moving around non-combat supply units, counting supply points etc. is much less fun. For this reason, we decided early on that the new game would not include a full-blown realistic model of supply. However, we felt that cutting enemy units from supply was a very interesting and useful tactical option, so we have included it in the game. It works like this: when a group of units is encircled by the enemy (only “passable” terrain needs to be blocked), it no longer receives any supply, and on top of this, encircled units will get a progressive combat penalty every turn. So now, the player has a choice: tackle the next objective head on, or try to encircle it and weaken the defenders before dealing with them. Infantry unit is isolated on a small peninsula by the sea and the enemy. It does not get any supply here. Splitting units. In Panzer Corps 2 any unit can be split into two equal halves (of course, at a cost of additional unit slots) which will act on the battlefield as two independent units. 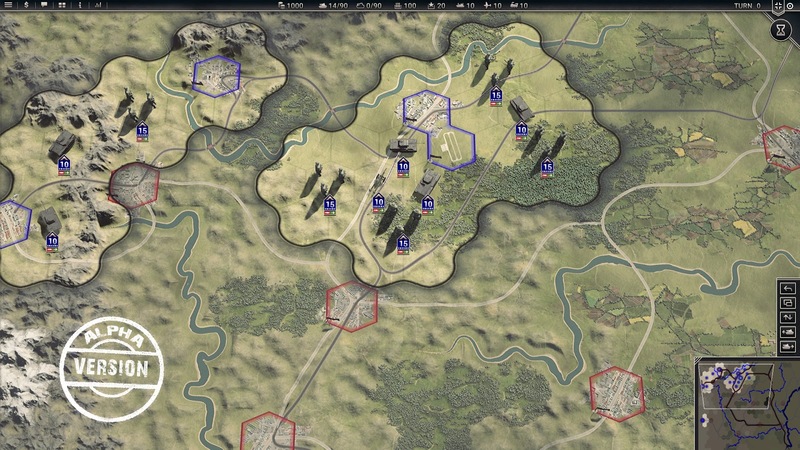 Splitting has countless tactical uses, especially in combination with encirclements as described above. Certain unit classes can especially benefit from it, like recon. Unique hero abilities. Unlike Panzer Corps, where heroes only gave stat boosts to units, in Panzer Corps 2 they will have many unique tactical abilities, and some of these abilities will be synergistic. So, using your heroes in the best way possible will be a different task in every playthrough. Air and Naval Warfare. Other major changes will happen in air and naval warfare. Ground combat was the most sophisticated and interesting part of Panzer Corps. With so many different rules, unit classes and terrain types, ground war was a varied and rich gameplay experience. We felt that air and naval warfare was somewhat lacking in comparison. 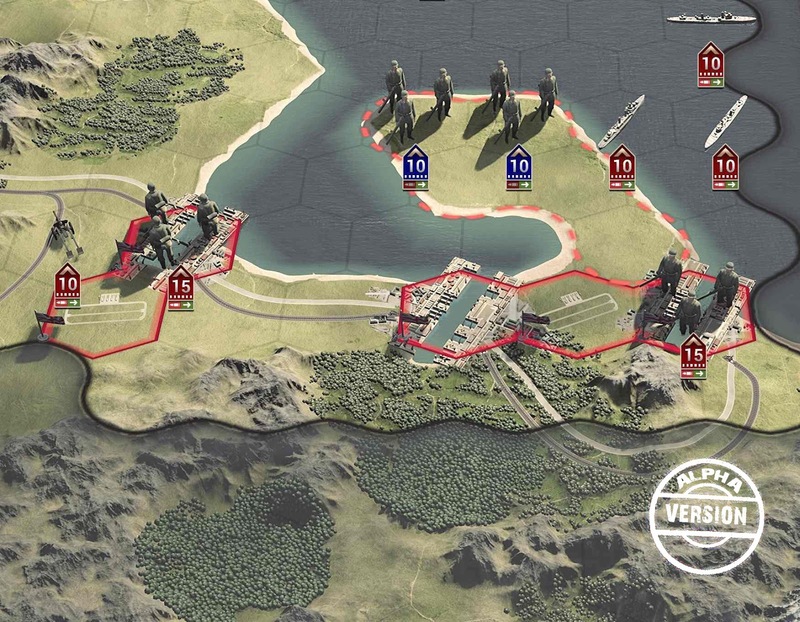 Our ultimate goal in the sequel is to make them interesting enough to allow dedicated “naval only” and “air only” scenarios, and to achieve this goal, we are looking at various “naval only” and “air only” hex-based wargames for inspiration. The most important change in the air war is that all aircraft act from airfields now, and return to their base automatically at the beginning of their turn. Also, just as in real life, the effectiveness of aircraft drops as the distance to their base increases. This means that all air rules and mechanics from Panzer Corps (like mass attack, interceptors etc.) remain in place, but at the same time the airfields, their location on the map, timely capture and proper defense become key elements in air warfare. As for naval war, naval terrain is “by definition” less interesting than ground terrain, with endless sea hexes going in all directions. To compensate for this, ships themselves will be more complex entities, with various factors (like orientation and position of turrets) affecting combat effectiveness, and a damage model (inspired by Pacific General) going beyond the simple “strength number” under the ship. Carrier and submarine classes will be much better fleshed out to represent their unique roles in naval war. A more advanced naval model will allow this series to branch out into any theatre of war in the future, including the “naval-heavy” Pacific, something which Panzer Corps never did.